Industrial Knives for the Paper Industry.Pulp and Paper, Tissue, Postpress and Printing Industry, Book binding and Binding Machines. Constantly high-quality products with long-lasting cutting quality. Doctor Blades, Folder Knives and Spare Parts for the Printing- and Packaging Industry.Gravure-, Flexo-, Offset-, Label-, Decor-, Corrugated- and Metal printing. Excellent products for maximizing your productivity. TKM – the specialists in printing and packaging. 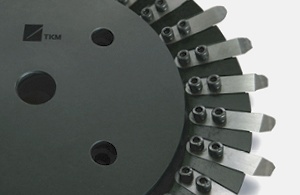 Log saw blades for the tissue converting industry. Precision and perfection for optimum cutting performance, surface finish and lifetime. Perfect for tissue paper, toilet paper, kitchen paper, paper towels and many other paper products. Saws and Knives for the wood industry.Sawmill, Veneer, Pulp, Plywood and Wood Panel Industry. Around 900 different blade types for all kinds of woodworking. Process-optimized machine knives with long service life. Efficient solutions for materials to be cut and machinery. Industrial Knives for the Plastic, Rubber and Recycling Industry. Set for recycling. Professional granulating – with know-how and application expertise. Machine parts for the bending industry, the press construction and further specific machine- and plant construction. Continual development over 100 years. From tools through precision components to machine systems. TKM Service. International Knowledge and Expertise for Long Service Life. From Maintenance, Regrinding and Coating, to Subcontracting and Training. TKM supported with experience and expertise for your operational fitness. ANTI GLUE KNIFE II, Plasma Knife and Shredder Head.For high-quality print products and efficient manufacturing processes. Three new product developments support and simplify the production and further processing. TKM is "German Design Award Winner 2018".EThe ultimate honor for our booth at DRUPA . 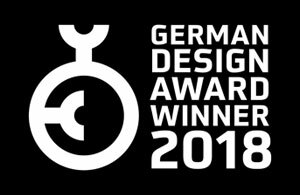 We are incredibly proud of the German Design Award 2018. Shanghai TKM Trading Co. Ltd.
For more than 20 years TKM Singapore provides high quality products and technical engineering services to its clients in the metal, paper and wood industry in Southeast Asia. As a part of the global acting TKM Group we are able to utilize our international Knowhow for our customer’s benefit.